More than an inexpensive overnight stay amidst the heart of Dresden! Just a 3 min walk from train station Dresden-Neustadt a cosy place with friendly & helpful staff waiting for you ... come in and convince yourself! * Reception open from 8 a.m. until 10 p.m.
24 Check-in & Out possible – Please give us a note! arcades) and the shopping street Prager Strasse. The hostel is located on a very quiet side road and has it's own parking lot. The large lawn allows BBQ nights and crackling campfires at the end of the day ... you should come in and enjoy your stay! We help you plan and organize your holiday, and make sure that our guests can lean back and relax in a comfortable atmosphere at the end of a long day ... just come by and make yourself at home! * We do not accept kids to sleep in the dormitories! Please book a private room! We don't accept credit or debit cards - payment in cash on arrival. There is an ATM just around the corner from the hostel. Starting July 1st, 2015 the city of Dresden is charging its guests with a lodging tax. This tax depends on the duration of stay and will be calculated from the total price of the accommodation cost. More information about the tax you will find at the website of the town Dresden. 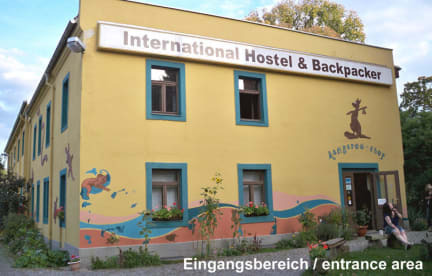 This Hostel is NO GROUP-HOUSE - in case you are more than 8 people and you will make several small bookings to avoid / bypass the automatically limit by Hostel World we will cancel these bookings again (please consider that you will lose the deposit which you pay directly to Hostel World with the booking!). In case we will realize that you are a group not until your arrival we will NOT check you in and in case we realize it after the check in we will check out the group immediately (before the departure). Everything was fine and as expected, happy with the experience! Superb customer service! The people of this beautiful hostel are the kindest of any work staff I’ve ever met. The rooms are nice and open as well. The lounge is open and the kitchen is well stocked. You won’t regret staying here! Placed amidst fancy new buildings all surrounding the Kangaroo-Stop, this hostel allows getting a feel from the past. Nice place to conveniently stay! Friendly staff who was willing to offer some insights of the city and what is really worth checking out and what doesn't show up in guide books. Comfortable beds, quiet area, Overall great stay! Hostel well placed but room set ups were a little bizarre and the showers weren't comfortable to use. All in the price I suppose but the staff were very friendly and helpful. Would recommend. This hostel is nothing particularly special, but a nice place to stay all the same. The rooms were clean and the bathrooms well equipped. Not much in the way atmosphere, but we didn’t seek it out. Recommended if you are looking for somewhere for a weekend break. The location was okay--better for nightlife than for visiting historical Dresden. The tram is close. The bathrooms were a little dirty and dated. They have renovated some of the shared kitchen areas. The cost went up as we paid for bedding & city fees. In my opinion charging for linens is tacky; hostels should include it in the price. We paid for linens, made our beds, and returned the linens to the front desk...I realize that some hostels operate this way, but it lowers my rating. This place is just a roof over your head. No atmosphere, your shower will probably be on another floor. Staff is about as friendly as 3 day old sushi.